How was your trip to Portugal, Lauren David? This week’s Portugal travel tale comes from Lauren David. She’s managed to explore a fair portion of Portugal via public transport and has fallen for Portuguese food. Welcome, Lauren. Please tell us a little about yourself. Hi my name is Lauren and I’m from the San Francisco Bay Area, California. I’m currently living in Vitoria- Gasteiz, Basque Country, Spain working as a cultural and language assistant through the Spanish Ministry of Education (aka, assistant English teacher). 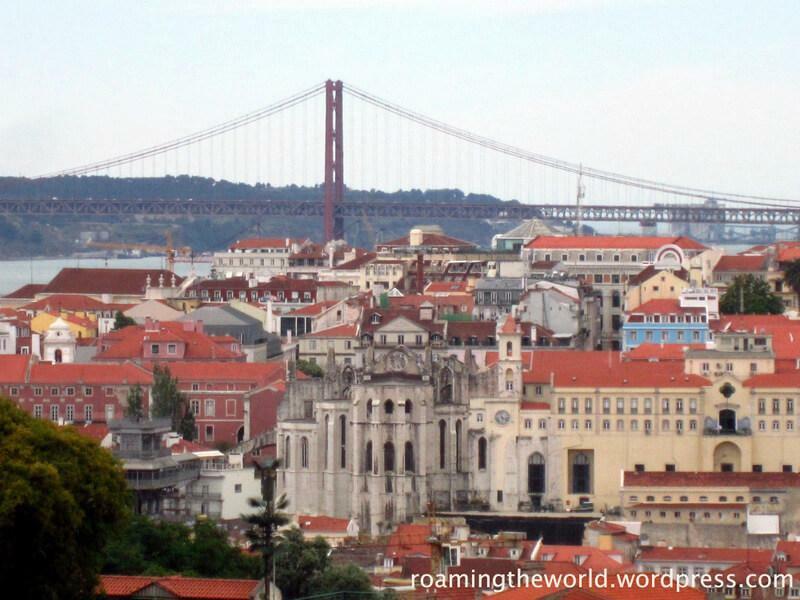 I traveled to Portugal for the first time January 2012 and fell in love with Lisbon practically the moment I stepped off the plane. After 3 days of sightseeing, eating the food and meeting locals, I was hooked. I was already planning when I could return. I returned with my brother for 2 weeks traveling to Porto, Coimbra, Lisbon and the Algarve in the summer of 2012. I flew from Madrid to Lisbon on my first visit with Air Europa and was surprised that it was cheaper than the bargain airlines. My second visit I took an overnight Alsa bus from Salamanca to Porto. The bus was fine but my hopes to sleep and gain a full day, didn’t happen. Whereabouts did you stay? And what sort of accommodation did you have? How was it? I stayed in hostels in every city I visited. There are many options and I was lucky that all the hostels I stayed in were great! 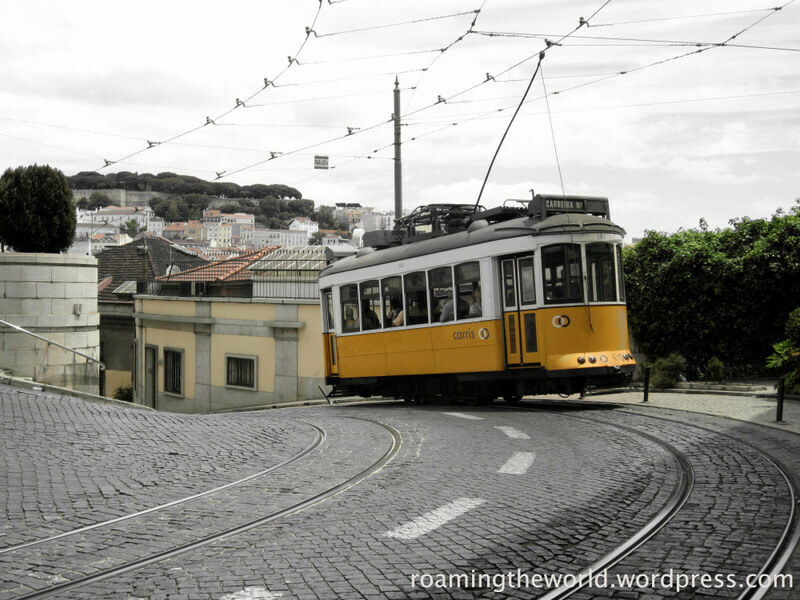 When we weren’t walking everywhere in Lisbon, we’d hop on a bus, cable car, tram or metro depending on where we were going. Public transportation is very convenient and easy to use, except buying tickets was frustrating. It cost quite a bit more to buy on board vs. buying at the metro station to use the trams and cable cars. Since we didn’t have a car, we took public transportation everywhere. The first time I went to Lisbon, I knew next to nothing. The second time around, I was more familiar with Portugal but also did a bit of research. My brother bought a guidebook, which was helpful for background info and possible things to do in each city we visited. Talking to locals and occasionally asking hostel staff for their recommendations. Eating the food and exploring. Seeing a new country and visiting new cities and towns. Lisbon- hearing a live Fado show because it gives insight to Portugal’s history and culture. Take a walk through the Alfama district and you’ll feel like you’re walking through another era. I was really excited to visit the Algarve despite not having a rental car to freely explore. My brother and I initially had plans to visit Faro but when hostel reviews weren’t favorable we changed plan and went to Lagos. Lagos is a pretty place, with beautiful picturesque beaches but it’s the Australian “spring break” and summer break destination. What is Mexico to party-going Americans is Lagos, Portugal for party-crazy Australians. Needless to say, since I wasn’t in the mood to drink myself silly nor with a young crowd, I felt out of place. However, I enjoyed relaxing on the beach, kayaking through the caves and celebrating my brother’s birthday. Buy public transport tickets at the metro ticket stations because buying onboard costs a lot more. The town of Lagos because I was surprised it has become over touristed with party-goers. I wondered where all the Portuguese had gone. It’s a city that only thrives in the summer. There are so many delicious foods to try! I was in foodie heaven sampling pastries and cookies at almost every pasteleria I walked past as well as every stand and eat café I walked by where you could sample a variety of little pastries. So delicious. bacalhau– cod seems to be the mascot to Portuguese cooking, as well as Sardines. There is a big sardine festival in the summer! Chocolate pudding- seems to be on almost all the menus and with good reason! Portugal is full of life and magic- a place where buildings are more colorful, people are cheerful and friendly and the food delicious yet cheap with a varied and incredible landscape. I’d rent a car to explore the Algarve. Next time I’m in Porto , I’d go on a Douro tour. I tend not to do the typical touristy routes but after hearing of other’s traveler’s experiences taking a Douro tour, it seems worth it, plus you get great views of the city from the river! I’d love to come back and see some of the surf spots North of Lisbon. If you’re in Lisbon, I highly recommend a day trip to Sintra, a magical fairytale-esque town full of palaces, gardens and castles to visit and a day trip to Cascais, a beach town 40 minutes on the train from Lisbon. Blogger Biography: Lauren David writes at Roamingtheworld, which she began in 2007 when she set off with a one-way ticket to travel from Eastern to Southern Africa solo. Nine months later, she accomplished a dream and started growing roots in the San Francisco area teaching kids about gardening until she got itchy feet 3 years later and moved to Andalucia, Spain in 2011. She’s since traded beach days and free tapas for gray skies, lots of rain and occasional snowstorms in Basque country. She’s teaches English by day and writes at night. Her blog is about life as an expat, travels, food, her perspective and the unexpected. You can also follow her on Facebook. Previous Post: How Was Your Trip To Portugal, Alison Cornford-Matheson? So sorry,Julie,I mistaken your name!!! I love your posts on Portugal and the way you talk about this country! I visited it only once and I totally agree with your comments and descriptions…..they make me want to come back soon! Thank you ,dear Lauren for the share! Thank you for your kind words. It makes me very happy when I hear that reading my blog makes you want to come back to Portugal – that’s exactly what I want to achieve. I hope you come back soon.